Cambridge, Mass. – August 29, 2013 – In a materials science laboratory at Harvard University, a transparent disk connected to a laptop fills the room with music—it’s the “Morning” prelude from Peer Gynt, played on an ionic speaker. No ordinary speaker, it consists of a thin sheet of rubber sandwiched between two layers of a saltwater gel, and it’s as clear as a window. A high-voltage signal that runs across the surfaces and through the layers forces the rubber to rapidly contract and vibrate, producing sounds that span the entire audible spectrum, 20 hertz to 20 kilohertz (see video below). But this is not an electronic device, nor has it ever been seen before. Published in the August 30 issue of Science, it represents the first demonstration that electrical charges carried by ions, rather than electrons, can be put to meaningful use in fast-moving, high-voltage devices. “Ionic conductors could replace certain electronic systems; they even offer several advantages,” says co-lead author Jeong-Yun Sun, a postdoctoral fellow at the Harvard School of Engineering and Applied Sciences (SEAS). For example, ionic conductors can be stretched to many times their normal area without an increase in resistivity—a problem common in stretchable electronic devices. Secondly, they can be transparent, making them well suited for optical applications. Thirdly, the gels used as electrolytes are biocompatible, so it would be relatively easy to incorporate ionic devices—such as artificial muscles or skin—into biological systems. After all, signals carried by charged ions are the electricity of the human body, allowing neurons to share knowledge and spurring the heart to beat. Bioengineers would dearly love to mesh artificial organs and limbs with that system. The audio speaker represents a robust proof of concept for ionic conductors because producing sounds across the entire audible spectrum requires both high voltage (to squeeze hard on the rubber layer) and high-speed actuation (to vibrate quickly)—two criteria which are important for applications but which would have ruled out the use of ionic conductors in the past. The traditional constraints are well known: high voltages can set off electrochemical reactions in ionic materials, producing gases and burning up the materials. Ions are also much larger and heavier than electrons, so physically moving them through a circuit is typically slow. The system invented at Harvard overcomes both of these problems, opening up a vast number of potential applications including not just biomedical devices, but also fast-moving robotics and adaptive optics. Sun works in a research group led by Zhigang Suo, the Allen E. and Marilyn M. Puckett Professor of Mechanics and Materials at Harvard SEAS. An expert in the mechanical behaviors of materials, Suo is also a Kavli Scholar at the Kavli Institute for Bionano Science & Technology, which is based at SEAS. Suo teamed up with George M. Whitesides, a prominent chemist who specializes in soft machines, among many other topics. Whitesides is the Woodford L. and Ann A. Flowers University Professor in the Department of Chemistry and Chemical Biology, co-director of the Kavli Institute at Harvard, and a Core Faculty Member at the Wyss Institute for Biologically Inspired Engineering at Harvard. Sam Liss, Director of Business Development in Harvard’s Office of Technology Development, is working closely with the Suo and Whitesides labs to commercialize the technology. Their plan is to work with companies in a range of product categories, including tablet computing, smartphones, wearable electronics, consumer audio devices, and adaptive optics. “With wearable computing devices becoming a reality, you could imagine eventually having a pair of glasses that toggles between wide-angle, telephoto, or reading modes based on voice commands or gestures,” suggests Liss. For now, there is much more engineering and chemistry work to be done. 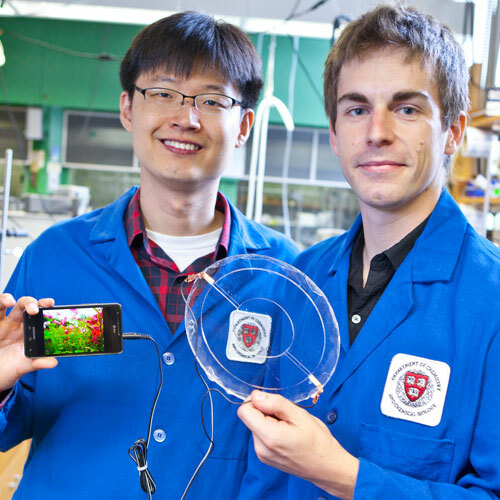 The Harvard team chose to make its audio speaker out of very simple materials—the electrolyte is a polyacrylamide gel swollen with salt water—but they emphasize that an entire class of ionically conductive materials is available for experimentation. Future work will focus on identifying the best combinations of materials for compatibility, long life, and adhesion between the layers. In addition to Keplinger, Sun, Whitesides, and Suo, coauthors included Keith Choon Chiang Foo, a former postdoctoral fellow at Harvard SEAS, now at the Institute of High Performance Computing in Singapore; and Philipp Rothemund, a graduate student at Harvard SEAS. This research was supported by the National Science Foundation through a grant to the Materials Research Science and Engineering Center at Harvard University (DMR-0820484) and by the Army Research Office (W911NF-09-1-0476). It was also enabled in part by the Department of Energy (ER45852) and the Agency for Science, Technology, and Research (A*STAR), Singapore.